The scintillating success of Apple and Samsung gadgets are no secret to the world of technology. Motorola with its unique design and powerful models have always had a distinct success. The American brand has a knack of producing surprisingly lovable mobile phones every now and then. The Motorola Droid Razr HD falls under this category. Here is a review on the powerful Motorola Razr HD. Priced at $199.99 The Droid HD carries all the great specifications of the original Droid Razr with more polished and uplift features. Powered by a 1.5 GHz dual core processor with the latest Snapdragon S4 CPU, with a RAM capacity of 1GB, the new Motorola redefines power. As you would expect, the power is complemented by is huge 4.7-inch AMOLED display with a resolution of 720p. Critics have already claimed that the new model is the best in the series of Razr mobile phones yet. The width of the mobile is an inch thicker than the older model while the new model also boasts HD capability. The Motorola’s Android 4.0 operating system, enhanced user interface in addition to Verizon 4G LTE data clearly makes it one of the hottest gadgets for the season. Of course, the Droid Razr has to face rivals like the Apple iPhone 5, Samsung Galaxy S3 and the one in its own family – the Droid Razr Maxx HD. On the negative side, the machine’s camera lacks the quality of the killer shooting skills of some of the other devices in the segment. 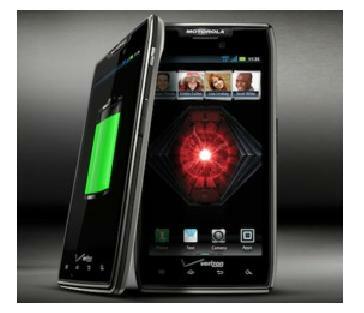 Motorola Droid Razr measures 5.2 inches in length, 2.74 inches in breadth and is 0.33 inches thick. The large make of the mobile phone does not actually mean that it isn’t pocket-friendly as it weighs just 5.1-ounce. A silver strip circling around the edges of the phone lends the device a touch of class and luxury. There is a single physical button for volume adjustments and power key stitched on the right side of the phone. However a dedicated shutter button to access the camera quickly is missing on the outer cover of the phone. The LTE SIM card slot, slot for microSD, USB slot and a micro port for HDMI are all flooded on the left of the phone. There is a 3.5mm jack on the top of the phone. The rear camera with 1.3 MP capacity is to complement the mail camera that is capable of taking 8-mega pixel photos. One of the superior features of the phone is its expansive 1,280x720-pixel display which is 4.7-inch big. With its HD resolution of 960 x 540, it is much sharper than most smartphones around. The Droid makes use of virtual keyboard with well-spaced keys for quick and accurate message typing. Switch to Swype keyboard and that makes it more friendly for one-hand use. The Razr HD runs on the ICS or Android 4.0 Ice Cream Sandwich that gives a modern look along with many enhancements when compared to the Android 2.3 Gingerbread. It is also reported that in future the device will be updated with Jelly Bean. The phone offers two home screens but you can customize it to be seven with a variety of applications and widget shortcuts. The Quick Setting screen gives you quick access to Bluetooth, Airplane mode, GPS, Wi-Fi and many other setting options. To sum up, the Motorola Droid Razr HD is a worthy upgrade but one would love to consider other smartphones as well. If the stylish design with premium metallic outlook impresses you, then have a go. But think twice if you are a frequent shooter. This is a guest post by Sofia Fern. She is a guest writer who writes more about digital cable and high speed internet. To get more information click here.